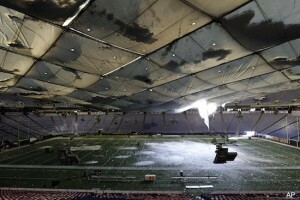 Home » Offbeat » (Video) Metrodome Dome roof collapse! (Video) Metrodome Dome roof collapse! Cameras were positioned inside the stadium and caught the collapse on tape. To call the video incredible would be an understatement. It looks like the beginning of Armageddon. Here’s the awesome video for you taken by Fox! Jean Claude Van Damme's Epic Split Between 2 Moving Trucks!! Previous: Julian Assange Freed On Bail! Next: BCCI to lose control over Indian Cricket?